To award individual and/or organizations both domestically and overseas, for their contributions made into developing or improving the investigation into or research of medical diagnosis and related social welfare, nuclear accidents and so on. 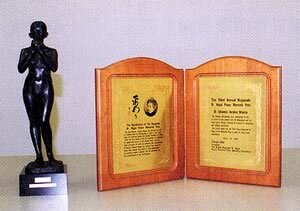 To award individuals and/or organizations both domestically and overseas, for their contributions made into developing or improving the investigation into or research of medical diagnosis and related social welfare problems associated with radiation exposure after atomic warfare, nuclear accidents and so on. The work of the ideal candidate will, furthermore, be one of value to future efforts made in the field. Nagasaki Association for Hibakushas' Medical Care will be accepting nominations for a suitable candidate for the above prize from domestic and internationally-based academic or professional individuals, as well as university, research, government, or other bodies. The Nagasaki Dr. Nagai Peace Memorial Prize Selection Committee, a body comprised of individuals of experience and academic standing, will select preliminary final candidates from among those recommended. The final winner will be selected by the Nagasaki Dr. Nagai Peace Memorial Prize Committee, a body comprised of learned individuals from various related backgrounds. Dr. Nagai devoted himself to the relief activities of atomic bomb survivors, although he was seriously injured by the atomic bombing at the Nagasaki Medical College in August of 1945. The next year he became a professor at Nagasaki Medical College, but he soon fell seriously ill as a result of leukemia. Though being confined to bed, he contined to pray and wish for peace and produced many works such as"Kono Ko Wo Nokoshite" (Leaving These Children Behind) and "Nagasaki no Kane" (Bells of Nagasaki). His lofty spirit of peace has left positive impressions on many people even now. Feb.3,1908 Born in Matsue City.Moves With his family to Iishi-mura (now Mitoya-cho) , Iishi - gun Shimane Prefecture. March,1932 Graduated from Nagasaki Medical College. June,1932 Appointed to the position of assistant. Specializes in radiology. April,1940 Appointed to the position of assistant professor at Nagasaki Medical College and chief of the Physical Rehabilitation Department. March,1944 Receives a doctor in medicine. June,1945 Found to be suffering from leukemia and told he had thee years to live. August 9,1945 Exposed to the atomic bombing and sufferes a severed artery on the right side of his head. Devotes himself to relief acdvities despite his serious illness. Jan. ,1946 Appointed to professor at Nagasaki Medical College. Nov. ,1946 Gives a lecttue on ''Atomic illness and Atomic Medicine"at Nagasaki Medical Association. March,1948 Moves his household to"Nyokodo". Oct. ,1948 Receives a visit by Helen Keller. May,1949 Receives a visit by Showa Emperor and a messenger of the Pope. Dec. 26,1949 Becoms the first person to be decorated as an honorary citizen of Nagasaki. May 1,1951 Enters Nagasaki University Hospital and passes Away at 9 : 50pm at the age of 43 years old. May 14,1951 Receives a public funeral by Nagasaki City and buried at the Sakamoto International Cemetery.